What’s this? A new comic? Finally? Sorry about the delay, all — I’m about to move apartments, and everything’s a little chaotic. There’s probably going to be some more comics-schedule crumminess in September, but once the dust settles it should be back on track. I was thinking about how these tend to be more ensemble-focused, and it’s kind of unusual to have several in a row like this with a scene just predominantly about Turpentine. It’s been interesting, digging a little deeper into this character. Aw, poor Turps. I know that feeling. I think we all do. It’s that not needing someone, doesn’t mean you don’t want someone, and distinguishing between the two can be hard. But mostly, love, or lack there of, can just bite sometimes. Lovely comic, as usual, Kathleen. I love how you use reds and pinks to highlight and pick things out when using Turpentine’s page color pallets. Thanks! With these extra-blue nighttimey pages, it becomes a real game of choosing where the red/pink accents are. …I think one of the things I really like about writing her is that she’s this confident loudmouthed troublemaker with like secret vulnerability. Nick, threeways are suppose to be rare you know. 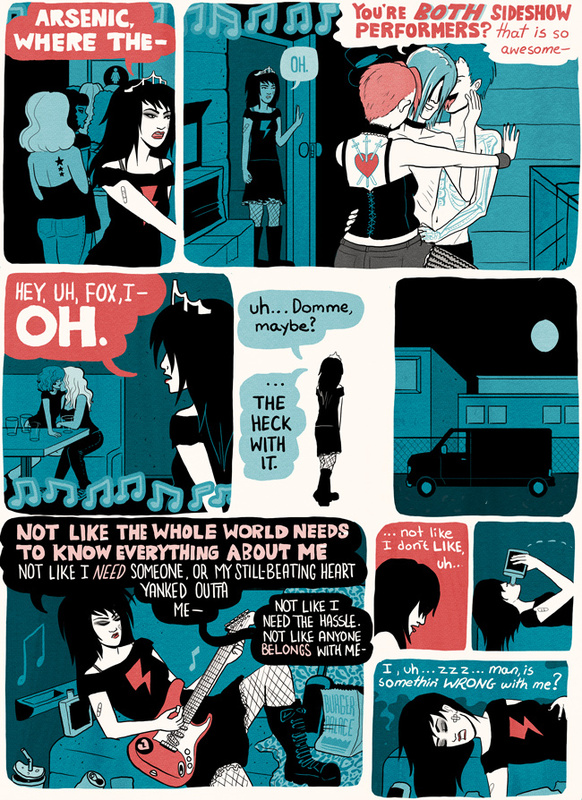 Hmm, Seeing Fox with someone made me wonder if she has anyone she likes, the beginning of the comic made me think she had a thing for Nick. Yeah, Foxy and Arsenic have always had this thing where they kinda casually flirt with each other. …She also always had this particular enthusiasm for the idea of him hooking up with Damon, so I imagine she was sort of disappointed to hear about how that fell apart and was declared Over Forever. Why, oh why no new updates here? Aw, it’s because I just moved to a new apartment, and it’s been a tornado of stress and having everything packed away and not set up. Things are almost back to normal, though! I have been missing doing regular comics SO MUCH, and I think I’ll be able to start updating again as of this Monday. where IS domme, anyway? working on her thesis? whipping someone? doing serious band business in some kind of responsible manner?